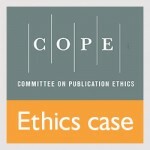 In this regular feature, we highlight an ethics dilemma from the searchable cases database operated by COPE, the Committee on Publication Ethics. In 2008, all Elsevier journals were enrolled in COPE so editors would have an alternative information resource when faced with research misconduct. The cases database contains details of, and advice given on, more than 500 cases and is just one of the many services COPE offers. In this issue, we highlight a case in which an editor was alerted to the fact that an article published in his/her journal had been previously published in a different journal. What would you do in this situation? Have your say in the comments section below or simply click on the link at the end of the article to find out what the COPE Forum advised. The editor of journal A was alerted to the fact that an article published in journal A had been previously published in journal B and constituted a duplicate publication. The editor contacted the authors who explained that they had tried to withdraw the article from journal B but their request was ignored and the article was published against their wishes. The authors contacted journal B with a request to retract the article. Journal B removed the article from its website but did not publish a retraction notice or any explanation as to why the article had been removed. The article published in journal B was not indexed in any indexing services, but the title can still be found by a search in Google Scholar. The editor of journal A wonders if they need to alert the readership to the fact that a reference to the same article in journal B can be found. They feel that retraction of the article from journal A is not the correct course of action in this case because the article is scientifically sound, and currently only the version published in journal A is available. However, readers may still be misled by references to journal B that can be found on the internet. * Should journal A publish an ‘Expression of concern’ to highlight the duplicate publication in the past. However, the article in journal B is no longer available. Perhaps a comment in the comments system of journal A would suffice?